Happy Monday Pin Money Girls!! Oh how I have missed you! My life has been crazy with moving (which is why I have been slacking lately!) But.. I promise I am back on track and even have some Pin Money style decorating ideas that I have been incorporating into my house that I can't wait to share! One of my new favorite looks is pairing neutrals during the winter months. The look isn't done a lot, and it always look crisp and clean. 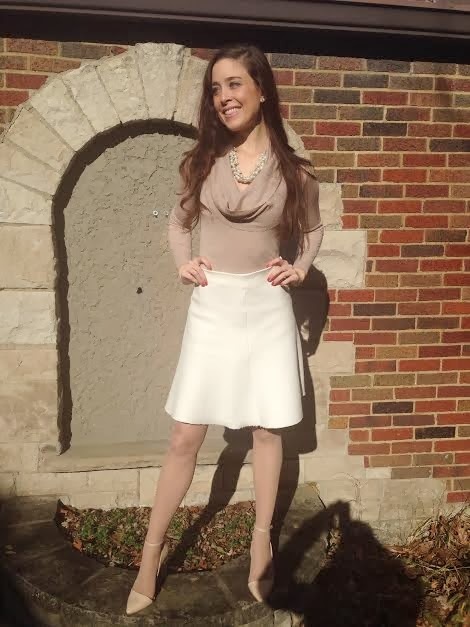 My neutral look below is perfect for the office or for a winter wedding shower or baby shower. My cream skirt is from Zara and can be found similar HERE (love this skirt super transitional and fits beautifully) My neutral fish nets are from Express and can be found HERE, my pearl necklace is from Forever 21 but absolutely love this H&M one found HERE, my oatmeal/tan sweater is from H&M, but I love this H&M one HERE, and my shoes I actually bought during the summer months at Forever 21 but can be found similar HERE. Please excuse the photo quality this round of pics! Everything I own has been on the fritz since my move! Have an amazing week Pin Money Girls! 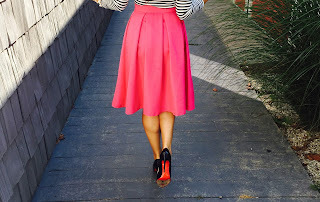 Rock some neutrals this week, and I promise you will love it. And here's one more neutral idea... pair your summer white jeans with a pair of camel colored boots, and warm gem tones, or animal print like I did here..